This story was delivered to BI Intelligence “E-Commerce Briefing” subscribers hours before appearing on Business Insider. To be the first to know, please click here. Amazon is set to enter the Vietnamese market by providing e-commerce services for the Vietnam E-commerce Association (VECOM), which is a group of 140 local online businesses, according to the Nikkei Asian Review. Amazon will help these companies sell and export their products through its platform, and details of its plans are expected to come at the Vietnam Online Business Forum 2018 on March 14. Partnering with third-party merchants is likely a precursor to Amazon entering the market with its full slate of offerings. Before launching its full marketplace and warehouse in Australia, Amazon helped Australian third-party sellers make offshore sales, and prior to recent reports that Amazon is looking to launch in Brazil, it ran a marketplace for third-party sales of electronics and appliances. The Seattle-based company may be looking to use its partnership with VECOM as a way of getting its footing in Vietnam and building familiarity with consumers before introducing its full marketplace, Fulfillment by Amazon (FBA), Prime, and more. This launch in Vietnam suggests that Southeast Asia is a focus for Amazon’s international expansion plans. Amazon also launched in Singapore, its first market in Southeast Asia, in July 2017, where it is now operating in full with Prime and Prime Now. 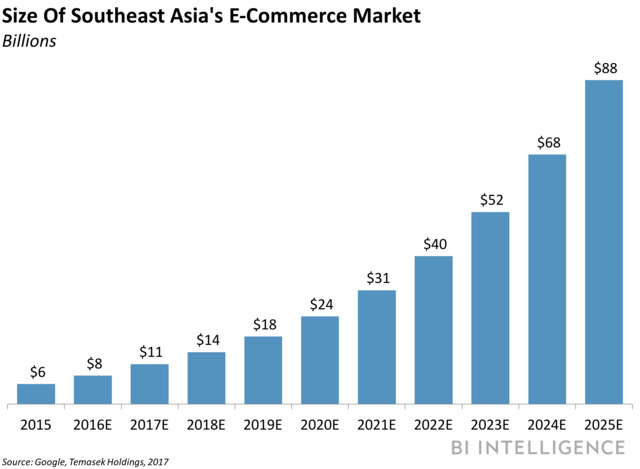 These first two forays occurring so close to each other may mean that Amazon has grand plans for the region, which would make sense as Southeast Asia’s e-commerce sales are projected to climb to $88 billion by 2025, up from an estimated $11 billion in 2017. The region is particularly valuable to Amazon because the growth of its Prime subscriber base is reportedly slowing, and international markets, especially ones with the potential of Southeast Asia, could provide a significant boost. Amazon will face stiff competition in Vietnam, and Southeast Asia as a whole, from Alibaba and JD.com. In Vietnam specifically, Lazada, which Alibaba owns 83% of, controls approximately 30% of the country’s e-commerce business, according to the Nikkei Asian Review.com. JD.com has shown interest as well, investing approximately $50 million in Tiki, a Vietnam-based online retailer that it intends to help with fulfillment, logistics, and more. The presence of both of these powerful companies will make it difficult for Amazon to succeed in Vietnam, and if the company looks to expand to other markets, like Indonesia, it will find similar situations, often with Alibaba and JD.com having a significant head start.